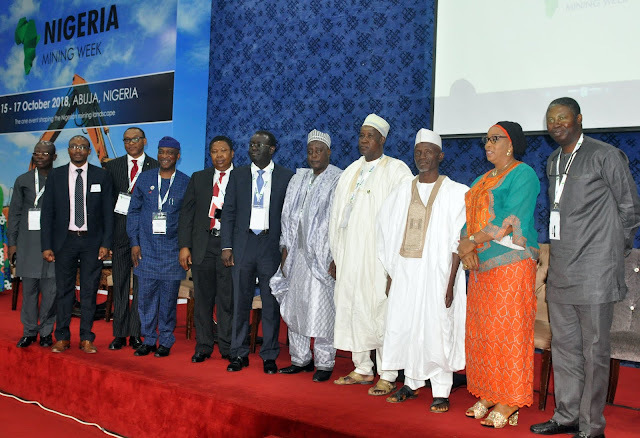 Cross section of guests at the opening ceremony of the 3rd Nigeria Mining Week which held from the 15 – 17 October 2018 in Abuja. The Conference is organised by the Miners Association of Nigeria in partnership with PwC Nigeria and Spintelligent. Leading professional services firm, PwC Nigeria has restated its commitment to supporting the growth of the Nigeria Mining Sector in line with the country’s overall economic diversification efforts. This assurance was given by the firm’s country Senior Partner, Uyi Akpata in his opening remarks at the 3rd edition of the Nigeria Mining Week which held at the NAF Conference Center, Kado, Abuja from 15 – 17 October 2018. Akpata who was represented at the ceremony by Dr Bert Odiaka, Partner and Head of the firm’s Abuja office noted that PwC’s commitment to supporting the sector was in line with the firm’s purpose of building trust in society and solving important problems. “I am happy and proud that our efforts to bring together stakeholders in this sector has yielded so much result. The mining week which is now in its third year has continued to get bigger and better with increased participation by stakeholders both from within and outside of our shores. At PwC, we have always advocated for an increased focus on solid minerals development for sustainable economic growth in Nigeria. We have long identified the potential of this sector in diversifying the revenue base of government and creating opportunities for our people and we have demonstrated this in various thought leadership activities. We however recognise that government cannot achieve it alone and that is why we have sustained our efforts in playing our own part in the organisation of this annual gathering. The Nigeria Mining Week is a three-day event organised by the Miners Association of Nigeria in partnership with PwC Nigeria and Spintelligent. The week provides a high-level, strategic mining investment platform, linking investors, project developers, financiers, technology providers and government to share best practices and demonstrate the latest strategies to evolve the sector successfully. Speaking earlier at the Pre-conference session, the Minister of state for Mines and Steel Development Alhaji Abubakar Bawa Bwari stated that private investors have expressed their readiness to commit about 3.32 billion dollars to fund some projects in the mining sector. According to Bwari, the fund will be used to fund gold mining and refining, foundry works, lead/zinc exploration and production, tin, tantalite and columbite mining and processing. The minister of state said that the ministry was making effort to focus on tackling challenges hindering the formal exploitation of gold, tin and lead-zinc as well stop indiscriminate exports of these mineral commodities to foreign smelters. Bwari said that the ministry had also developed a new Export Guidelines for the Export of Mineral Commodities to ease challenges surrounding the granting of export permits and other licensing issues. “We have strengthened our policy and institutional frameworks for investors in the mineral sector to ease their businesses. Government has released funds from Natural Resources Development Fund for the generation and provision of necessary geosciences data to attract investors. The Electro-magnetic survey data for three highly prospective gold and lead-zinc zones have also been acquired and are available for interested investors,’’ he said. Also speaking at the opening ceremony, the president of the Miners Association of Nigeria, Alhaji Sani Shehu, noted that a lot of progress had been made since the last conference with the Ministry addressing a lot of the issues raised by industry stakeholders. He, however, called for more efforts to be made especially in the area of access to the various funding initiatives being put in place for artisanal and small-scale miners. Goodwill messages were also delivered by Kwame Addo-Kufor, President of the ECOWAS Federation of Chambers of Mines, a representative of the National president of the NACCIMA and the Senior Special Assistant to the President on ERGP, Sani Yakubu who spoke on the place of mining in the economic recovery and growth plan of the current administration. As with previous editions, this edition of Nigeria Mining Week is well attended with delegates from established mining territories across the globe as well as local players, equipment manufacturers, financiers, and policy makers both at the state and at the federal level.